The Presidential Debates: What Was Missing? Since 1996, the deadliest war since World War II has claimed over 5.4 million lives due to war-related causes, and over two million people have been displaced in the eastern provinces of the Democratic Republic of Congo—roughly 500,000 since April alone. Civilians in the two Sudanese states of Blue Nile and South Kordofan are being held hostage by their own government as it continues to deny adequate access for vital humanitarian aid. Thousands are starving as more than 80 percent of households are surviving on less than one meal a day. True peace remains elusive between Sudan and the world’s newest country, South Sudan. The United States has deployed 100 military advisors to help regional forces battle the Lord’s Resistance Army led by ICC-indicted Joseph Kony. The LRA is responsible for some of the worst crimes against humanity of our time and is still operating in central Africa, now in its 25th year perpetuating fear, instability, and terror. These conflicts are some of the worst facing our world today. What else do they have in common? Neither President Barack Obama nor Governor Mitt Romney mentioned them in the presidential debates. Over the past few weeks, hundreds of activists took action to call upon the candidates to acknowledge and reveal what actions they would take in regards to these conflicts. 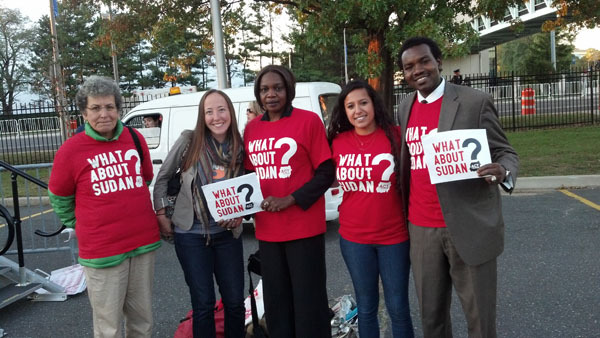 Signing petitions with Act for Sudan, tweeting at Bob Schieffer with STAND—activists all over the country raised their voices about the world’s worst conflicts. The Enough Project’s own Jennifer Christian was one of those voices when she visited Hofstra University for the second presidential debate. Christian, the Enough Project’s Sudan Policy Analyst, spoke with our partner Act for Sudan at the Free Speech area outside the debate auditorium, addressing a crowd of diverse human rights activists. Activists gathered at the debate center to raise issues left out of the election discourse so far. Christian along with other activists spoke on issues today in need of humanitarian intervention, such as Syria and, of course, Sudan. Christian focused her comments on the developing humanitarian crisis in Blue Nile and South Kordofan states of Sudan, a situation growing more desperate daily. In the elections of 2004 and 2008, Republican and Democrat presidential and vice presidential candidates alike spoke about Sudan during the debates, but this year they were both silent. In the foreign policy debate this week, candidates discussed a nuclear Iran, relations with Israel, the war in Afghanistan but nothing about the deadliest conflicts in the world. Even though the debates series is over, we refuse to be silent and will continue to push to make these issues the political priorities they deserve to be. Today, university students participating in the Conflict-Free Campus Initiative are beginning the #Vote4Congo campaign. This campaign is designed to show presidential candidates that when we vote this year, we’re not forgetting about Congo. Visit the #Vote4Congo homepage to take action and raise Congo into the election discourse. As mentioned throughout the debates, on November 6 voters will be making a decision that will shape the years to come. We invite you to raise your voice when you cast your ballot on the issues that must not be forgotten by the White House or Congress, no matter who takes office.